RMJ Surveys is a Family owned business located in Hampshire. The Company has an Established reputation for offering clients a High Quality, Highly Accurate, Prompt and Cost Effective service. RMJ Surveys are located in Winchester, just off M3 Junction 9. We are perfectly positioned for the M3, A34, M27, M25 road network and fast rail services to London and the South of England. The Company utilise up to date, sophisticated Land Surveying Equipment, coupled with, the latest electronic data recording and processing software. This enables us to produce your survey data, productively and accurately, giving you the most cost effective solution to your needs. The bulk of our Clients are repeat customers, or referrals from past clients. A high percentage of our contracts are in the South of England and London, with regular work throughout the UK, and on occasions, as far afield as Mainland Europe. 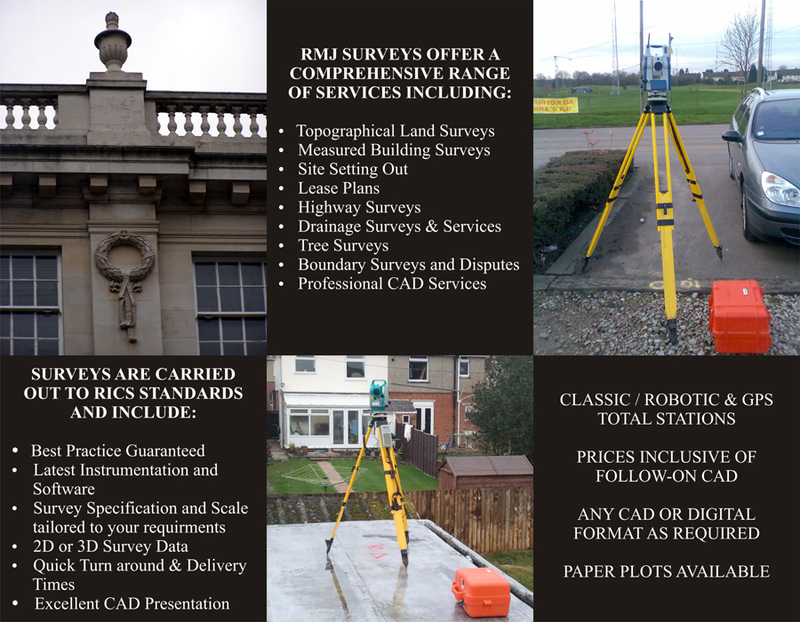 The use of Traditional Surveying Techniques, and the very latest in Surveying Equipment enable RMJ Surveys to produce logical, well presented, and Highly Accurate Drawings which clearly illustrate, and represent the detail Surveyed. For Any Questions you may have regarding the work we do, or for a Free, No Obligation Quotation, please do not hesitate to contact us by clicking HERE. Alternatively, for all of our contact details, please see our CONTACTS PAGE.